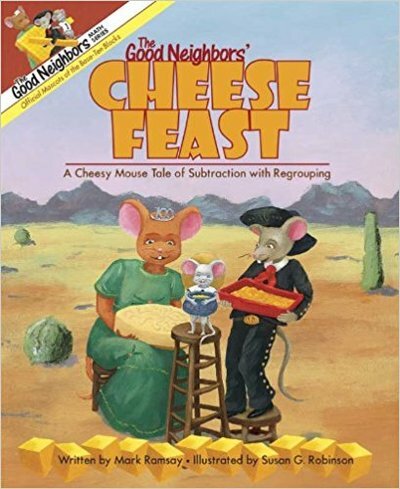 Mark Ramsay ​(New York) has authored three of our favourite mathematical stories: 'The Good Neighbors Store An Award: A Cheesy Mouse Tale Of Addition With Regrouping'​ (2009), 'The Good Neighbors' Cheese Feast - A Cheesy Mouse Tale Of Subtraction With Regrouping' (2009), and 'Onesie's Odd Job - A Cheesy Mouse Tale Of Even And Odd' (2016), all of which are published by Strategic Educational Tools (USA). 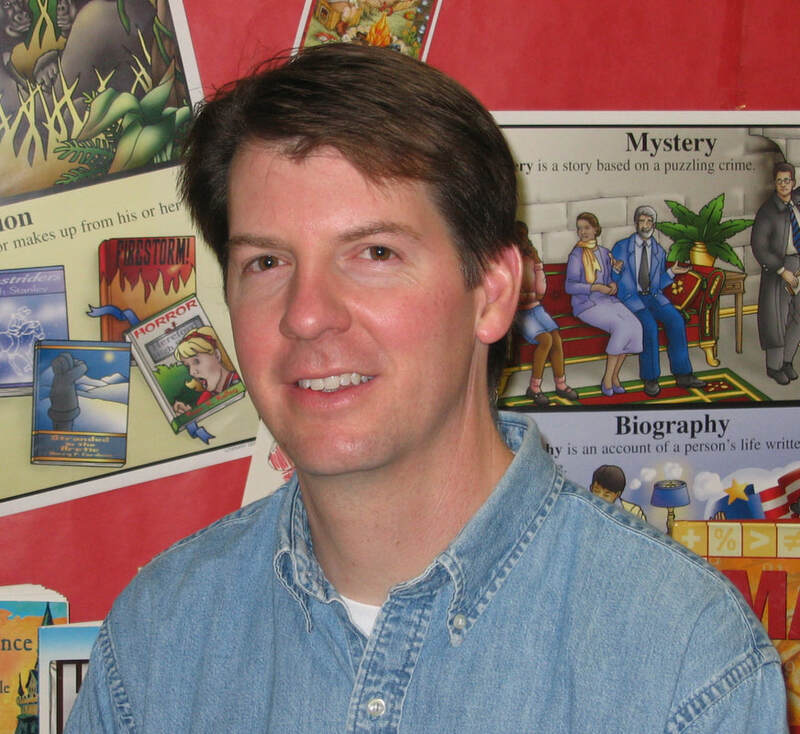 In addition to authoring mathematical stories, Mark also teaches elementary school students in kindergarten through fifth grade in the Sweet Home Central School District in Amherst, New York. We hope you enjoy reading Mark sharing his experience of working on these incredible mathematical story projects with you! Sailing is my favorite recreational activity. When I have a competent crew, I captain a 28-foot sloop, and when I’m solo, I captain a 14-foot dinghy. While my boats have a 2:1 ratio in length, they have a 58:1 ratio in weight. I am a lacrosse enthusiast. I began playing the game at a young age and continued playing through my collegiate years. At the age of 48, I can still shoot the ball about 80 mph. I enjoy cooking and baking traditional holiday foods from my Swedish heritage and my wife’s Polish heritage. Even from a young age, I remember math being a struggle for me. I dreaded the ‘Around the World’ fact games because I didn’t process numbers quickly. In middle school, algebra seemed like a foreign language, and in high school, I took only the required courses. However, for the past twenty years, I have enjoyed teaching math to disabled and non-disabled elementary students as a special education/intervention teacher. The challenge of teaching math concepts and skills so that all children can learn, apply, and have fun in the process, is what drives me everyday. 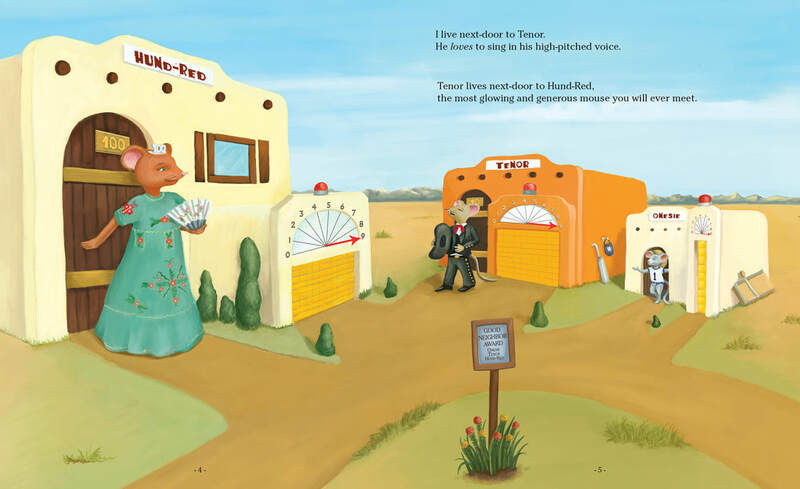 Creating ‘The Good Neighbors Math Series’ books has been a special part of my journey teaching mathematics. My mom and dad immersed me in picture books from a young age. My love for picture books was rekindled when I became an elementary teacher and a parent – an excuse to read picture books everyday! So I had a great love and respect for the authors/illustrators of picture books and dreamed of becoming one myself, but the specific inspiration for my books came from a 5th grade student who had a learning disability and was deaf. Kate struggled acquiring math concepts and processes. Visual models benefited her greatly, so base ten blocks helped her understand place value concepts and visualize processes that involved place value. When it came to mastering the addition and subtraction algorithms, base ten blocks definitely helped Kate, but she still struggled. I tried several additional strategies, and the one that was most effective for Kate was pairing a narrative with the addition and subtraction processes modeled with base ten blocks. At the conclusion of that school year, I decided to improve upon the rudimentary storylines I had used with Kate and put them into manuscript form. ​What were some of the key stages that you went through in creating your maths picture books? I begin by identifying the math concepts and processes that I believe can be clarified by a storyline and illustrations that model base ten blocks. Since my books are part of a series, I already have the basic foundation to work with (characters, setting, etc.). Next, I work on the general plot in conjunction with the visual models I believe are necessary to illustrate and illuminate the concept/process addressed in the book. My next step is to write the manuscript. When I have a finished manuscript, I lay out the text and make rough sketches for a 32-page book. Then I send the rough book layout to my illustrator, Susan Robinson, who begins the illustrations and the actual book design. I collaborate with Susan on the illustrations and the book design until we have a finished picture book. Writing the manuscript is the most difficult stage because writing doesn’t come naturally to me. Collaborating with my illustrator, Susan Robinson, is most satisfying because I can see my visions come to life and exceed my expectations. The first two books took about two years to complete. Being a new author and publisher, I went to writing workshops with my manuscripts, got feedback from several people, and conducted a lot of research on publishing while working on my stories. The third book took about a year to complete, but the actual writing came much more quickly since many of the story elements were already established in the first two books. ​Why do you prefer creating mathematical picture books with a storyline to, say, non-fiction mathematics concept books? As I mentioned above, the storyline and the corresponding illustrations provided the scaffolding, which allowed Kate and many other students to successfully acquire, apply, and retain the math processes addressed in my books, so the storyline is an essential component of my books. Developing a storyline to embed the math concept in hasn’t been too difficult for me so far, but I do rely on my editor, Nancy Raines Day, for some tweaking of story elements throughout the writing process. I draw my inspiration from my daily interactions with my students. 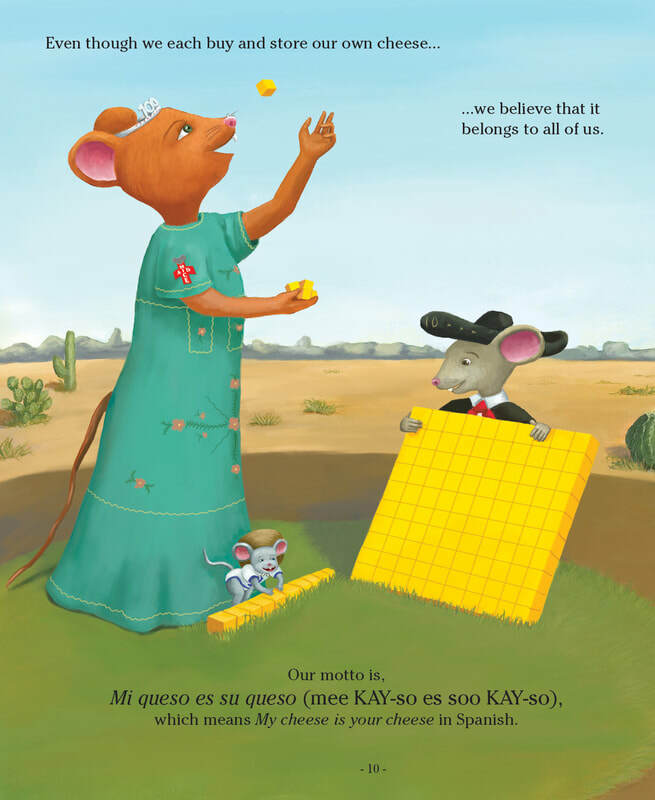 I have found that children love engaging personified animal characters, and since the yellow base ten blocks I use in my classroom look like cheese blocks, my characters had to be mice! The contexts of the first two books, storing objects for addition and cooking from a recipe for subtraction, provide the children with a real world context and a schema for the math process. The third book, about even and odd numbers with the context of a census, expands the children’s background knowledge, which I believe is also very important. Fans of the series can expect several more stories in the future. I have written four additional stories that are in manuscript form - I will explain why they have not been published yet in an upcoming question. My sentimental favorite picture book is ‘Pigs Go to Market – Fun with Math and Shopping’ by Amy Axelrod, illustrated by Sharon McGinley-Nally – I owe my livelihood to the book. Twenty years ago, I designed and conducted a demonstration lesson with the book to obtain my teaching position. So I guess you could say, the very first lesson I taught at my school district incorporated a math picture book! Amy and Sharon bring the hilarious Pig family to life and incorporate several math concepts and skills in each book. As I mentioned earlier, I have total control over the publishing process as an independent publisher – this is a blessing. Therefore, I can choose the content that I believe is worthy to published. Second, I can oversee the illustrations, book design and layout so that it is most beneficial to children and teachers/adults. ​The downside of being an independent publisher is that I have to fund all aspects of the publishing process. Publishing a book is expensive. I have eBook versions of my books, which are far less expensive to produce, but my printed books are more popular so far. Promoting a book is also expensive. Fortunately, with social media and websites like this one, word can get out about my books with little or no cost to me. The expense of producing and promoting a book is why I have not yet published my other manuscripts. "The first and greatest benefit of reading math picture books is engagement. I learned very early on in my teaching career that no learning occurs without engagement. A picture book is very engaging to children, so if one can be used to introduce, explain, clarify, or support a math concept or skill it is generally very effective." What do you think are some of the key benefits of children developing their mathematical understanding through maths picture books? The first and greatest benefit of reading math picture books is engagement. I learned very early on in my teaching career that no learning occurs without engagement. A picture book is very engaging to children, so if one can be used to introduce, explain, clarify, or support a math concept or skill it is generally very effective. Some other benefits of reading math picture books include the visual models, the schema, and the memory-aids they provide to students. What do you think are some of the key benefits of helping children to develop their mathematical understanding by encouraging them to produce their own maths picture books? As a teacher, I know a child truly understands a math concept when he or she can write his or her own question or number story about it. A picture book is just a more sophisticated and detailed version of a number story. A child has to think deeply about the math concept or process he or she is addressing in the book. I know I had to think deeply about the math content in my books. Even after many years teaching math, I discovered elements of the math content I never thought of before. An additional benefit of making picture books is that it is a cross-curricular activity, incorporating math, English language arts, technology, and fine arts. For teachers and parents who want to encourage their children to create their own maths picture books at school or at home, but are not sure how to guide them through the creative process, what would be your advice? Children are generally familiar with writing narrative stories in English language arts class, so I would recommend they create their math storybooks in a similar fashion. Once the child decides or is given the math focus for the book, he or she can begin with a story map to identify the key story elements including characters, setting, problem and solution/resolution. Then the child can begin writing a draft. After it has been self, peer, and adult edited and revised, the child can lay the text out in a mock book and add rough sketches. When the child is satisfied with the layout and sketches, he or she can begin the final publishing by hand or on a computer. For teachers and parents who want to have a go at having their own maths picture book published by a publisher, what would be your advice? I was unsuccessful finding a traditional publisher to publish my books, so I can’t speak to finding a publisher, but I can speak to becoming an independent publisher. I knew there was a need for math picture books with a base ten focus, so I took on the risks to independently publish my books. Even though I was right about the need for my books – as evidenced by steady sales and many glowing reviews, it has been more difficult than I ever imagined. I was naive in thinking that I could get my books into the educational marketplace because they are useful and effective books. It is very difficult if not impossible for a small publisher to get his or her titles into the large educational catalogs and online retailers. Fortunately, there are other large online retailers like Amazon that are willing to take on titles from small and independent publishers. This has made independent publishing possible for me. There are other options for the self-publisher, such as Print-On-Demand services (POD), but I did not choose this route. "The resources on MathsThroughStories.org are very impressive. My colleagues and I will particularly find the Recommendations for Mathematical Stories and the ‘How To’ Books databases extremely useful." The resources on MathsThroughStories.org are very impressive. My colleagues and I will particularly find the Recommendations for Mathematical Stories and the ‘How To’ Books databases extremely useful. Your finding (from Project 1) that most teachers recognize the benefits of integrating children’s literature in mathematical learning and teaching, is very encouraging. In terms of future research, I would love to see research related to my anecdotal findings that acquisition and retention of math processes can be improved by directly pairing narratives with the math processes. 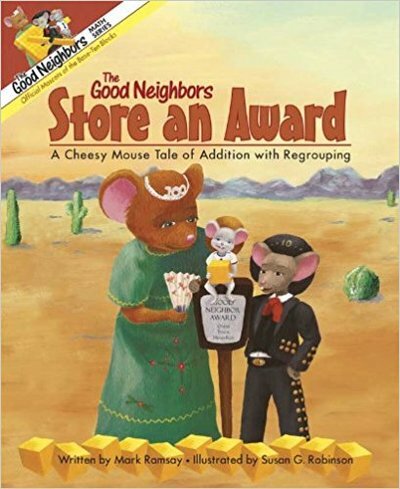 Illustrations copyright 2009 by Susan G. Robinson from The Good Neighbors Store an Award: A Cheesy Mouse Tale of Addition with Regrouping by Mark Ramsay​. Strategic Educational Tools. All Rights Reserved. 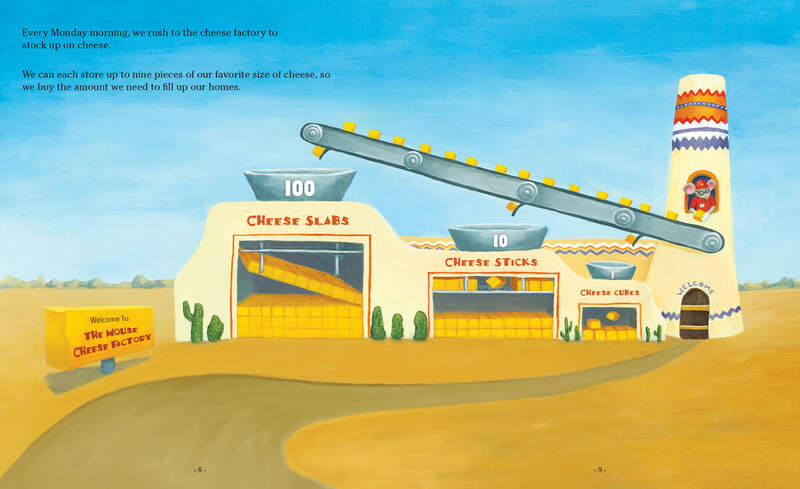 Illustrations copyright 2009 by Susan G. Robinson from The Good Neighbors' Cheese Feast - A Cheesy Mouse Tale of Subtraction with Regrouping by Mark Ramsay​. Strategic Educational Tools. All Rights Reserved. 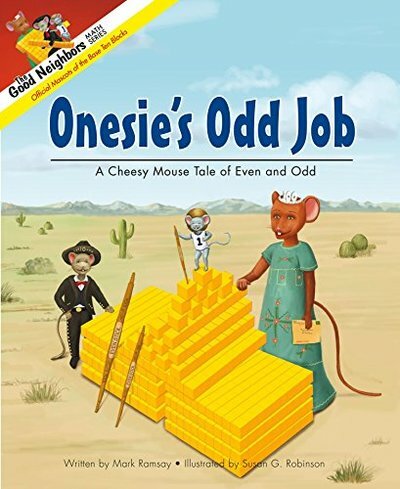 Illustrations copyright 2016 by Susan G. Robinson from Onesie’s Odd Job - A Cheesy Mouse Tale of Even And Odd by Mark Ramsay​. Strategic Educational Tools. All Rights Reserved. Have comments about this interview or Mark's books?